Dries Van Noten diagonally striped sweater. Crew neckline; solid trim. Long sleeves; contrast cuffs. Semi-fitted silhouette. Banded hem. Pullover style. Dries Van Noten diagonally striped sweater. Crew neckline; solid trim. Long sleeves; contrast cuffs. Semi-fitted silhouette. Banded hem. Pullover style. Viscose/polyester. Made in Belgium. Eileen Fisher sweater, featuring striped edges. Bateau neckline. Three-quarter sleeves; slit cuffs. Poncho-style fit. Pullover style. Tencel® lyocell/silk. Dry clean. Eileen Fisher sweater, featuring striped edges. Bateau neckline. Three-quarter sleeves; slit cuffs. Poncho-style fit. Pullover style. Tencel® lyocell/silk. Dry clean. Imported. 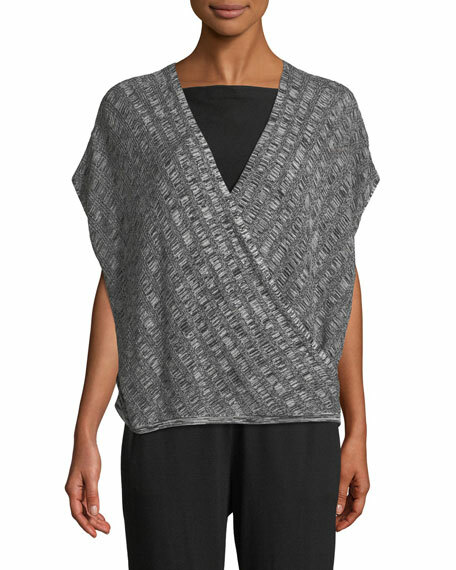 Eileen Fisher corded tunic sweater with tall side slit at right. High boat neckline. Elbow sleeves. Relaxed silhouette. Asymmetric hem. Eileen Fisher corded tunic sweater with tall side slit at right. High boat neckline. Elbow sleeves. Relaxed silhouette. Asymmetric hem. Pullover style. Organic cotton/recycled nylon. Hand wash. Made in USA. Eileen Fisher sleek sweater in a variegated pattern. Boat neckline. Long sleeves. Boxy silhouette. Vented sides. Pullover style. 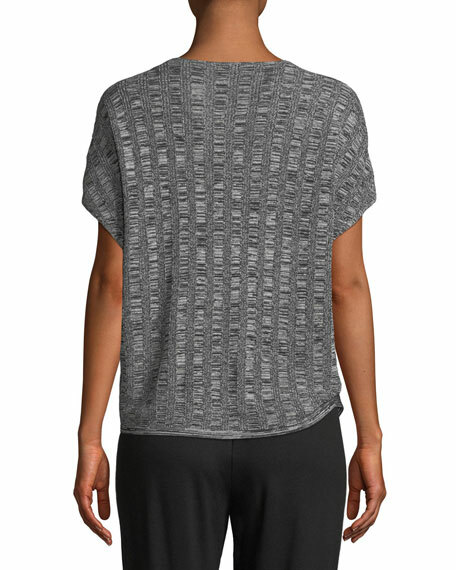 Tencel® lyocell. Eileen Fisher sleek sweater in a variegated pattern. Boat neckline. Long sleeves. Boxy silhouette. Vented sides. Pullover style. Tencel® lyocell. Hand wash. Made in USA. Model's measurements: Height 5'10"/177cm, bust 33"/84cm, waist 25.6"/65.2cm, hips 35.8"/91cm, dress size US 2-4/FR 34-36.